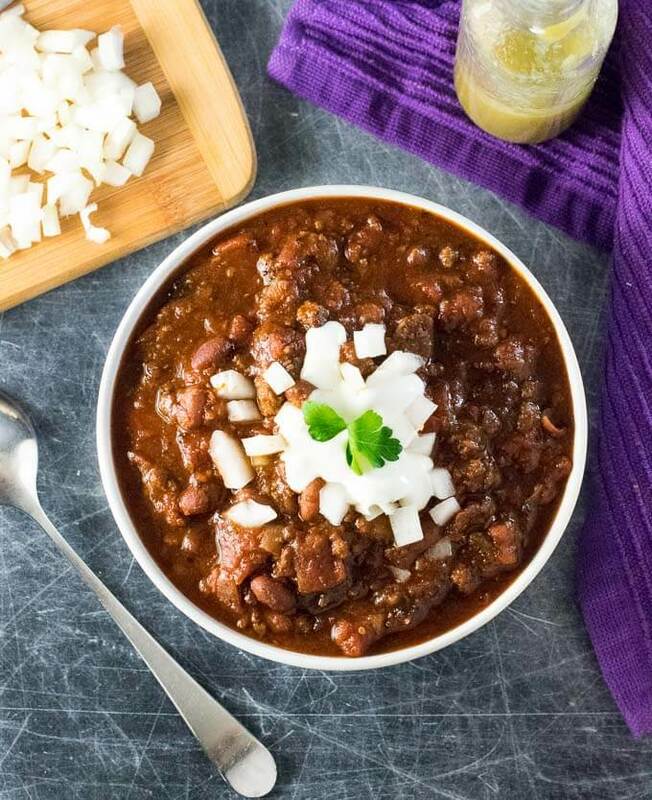 This classic thick and hearty Venison Chili recipe will warm you to your soul. As an equally passionate hunter and cook, I hope you find this recipe worthy of the effort required to secure the meat. I have to confess, I went shopping for venison this year. Yes, I spent hours looking in the woods first, but apparently, they were all out of deer. Admittedly, I am a public land hunter, which is awesome because you get all of the excitement of sitting in one spot staring at trees for hours on end without any of the added work of actually harvesting, dressing, and dragging out a deer. Thankfully, one of my friends came to the rescue traded me some venison for my Oreo Dip so I could make a batch of my wild game chili. I’ve been excited to share this recipe with you guys for a while now. So let’s dive in and discuss how to make the best venison chili! It is no secret, the thing that makes venison chili special is the ground venison. For venison, like beef, the ideal chili grind is coarse because it lends a better texture to the final chili. This differs from the grind used for venison burgers, for example, which is typically double ground using a finer plate. Simply ask your deer processor to run a few pounds of your venison for chili and he will know what to do. Otherwise, if you grind your own meat, run some venison and pork fat through your coarsest grinding plate (8mm plate is great) in one pass then gently mix together. This will make phenomenal venison chili. I like an 80/20 blend of meat and fat because the fat will really carry a lot of the flavor of the seasonings. However, I suspect most of you reading this already have your venison ground and packaged. Chances are the butcher ran it through the grinder twice on a medium grinding plate and blended it with a varying percentage of beef or pork fat. Don’t fret, I use this meat all of the time, it will still make fantastic venison chili! I recommend using a Dutch Oven when making chili because it will help you build layers of flavor. The wide base makes it ideal for browning your meat and vegetables, while its thick sides retain heat exceptionally well for long, even, simmers. I use a Dutch Oven for anything that will simmer for an hour or longer. However, a traditional soup pot will still work well for chili. When browning meat for chili, you actually want a brown crust to form on the meat, or at least on the bottom of your pan. This will melt into the chili during the simmer, adding exceptional flavor. For this reason, I also add the garlic, tomato paste, and chili seasonings to the saute before the liquid is added. It helps the flavors bloom before swimming in broth and sauce. 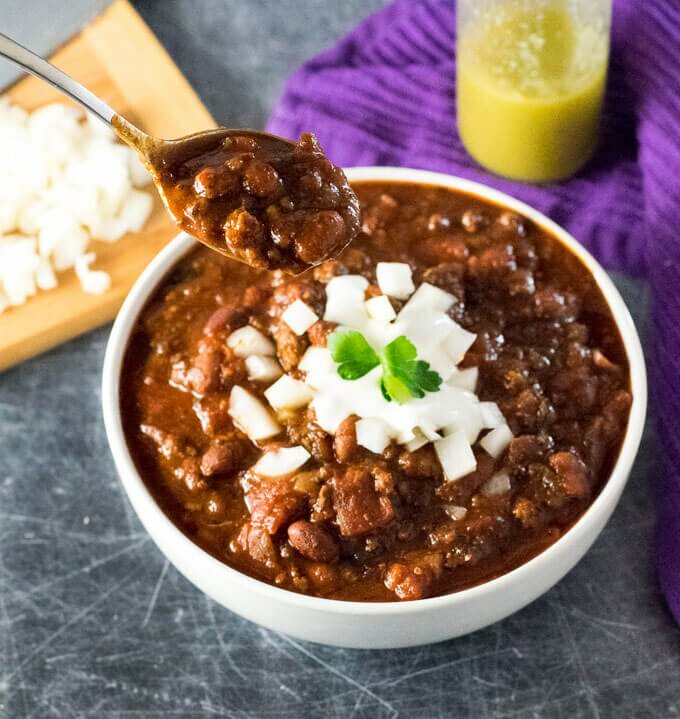 Like any chili, you will find the flavors meld together beautifully when left in the refrigerator overnight, making the leftovers even better than the original serving. It does have a tendency to thicken while sitting in the fridge, so thin it out with a few splashes of water if needed. You can adjust the spiciness of your chili most easily with your chili beans. They are typically sold in mild, medium, and hot spice levels. Simply purchase the heat level that fits your family’s preferences. Any chili recipe will taste best if cooked in a Dutch Oven, layering flavors as described above. 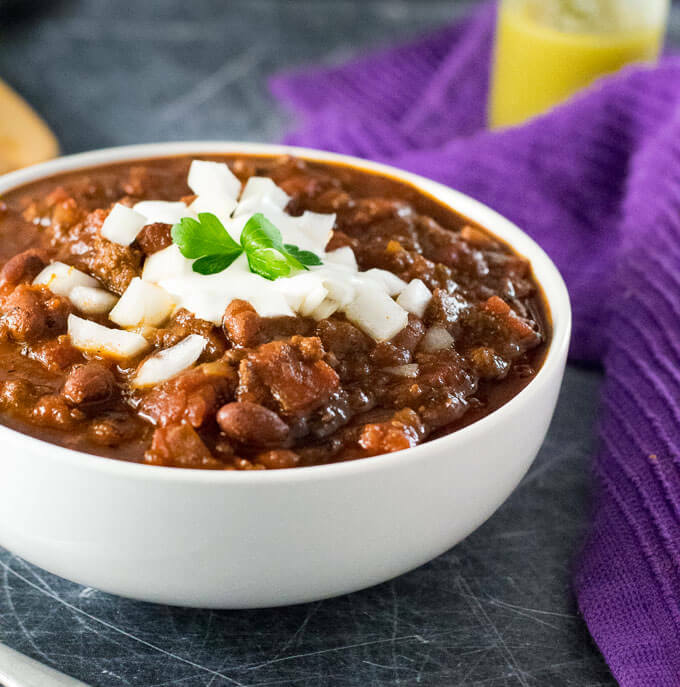 However, you can make venison chili in a slow cooker by simply adding all of the ingredients together and letting it simmer away. It is an easy way to make chili, and it still tastes great. Though, if you are willing to take the extra effort to complete steps 1 & 2 of my recipe prior to adding everything to a slow cooker, you will be rewarded with a much richer flavor. Once all of the ingredients are added to your crock pot, cook it on high for 4 hours or longer. This article contains affiliate links. 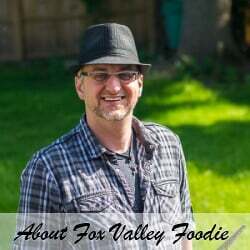 Any Amazon purchases made through these links help support FoxValleyFoodie.com at no additional charge to you! Heat oil in a Dutch Oven or large pot and add venison, onions, and peppers. Cook on medium-high heat until meat has browned and onions and peppers are tender. Add garlic, tomato paste, and chili seasonings. Cook for two minutes longer, or until fragrant. Add remaining ingredients, stir together, and simmer for 3 hours, or until thickened to your liking. Ladle chili into bowls, top with desired garnishes and serve. IF YOU LIKED THIS RECIPE you are going to love my Roasted Venison Loin with Balsamic Pan Sauce recipe too! If you enjoyed reading about my Venison Chili recipe then you should probably like me on Facebook and follow me on Pinterest too. That’s what I would do at least, because if you don’t get to know me but you still use my recipe it is kind of like taking candy from a stranger, and your mom taught you not to do that. Don’t disobey your mom, subscribe to Fox Valley Foodie today. This is the best venison chili recipe I’ve tried! Made this chili recipe with venison….turned out awesome !! Best chili I have ever made. Would smoked paprika instead of regular paprika be ok in this recipe? Absolutely! I love smoked paprika but sometimes I don’t include it as an ingredient because not everyone keeps it on hand. But yes, it would be a phenomenal substitution! I made this tonight, and once again another recipe that was the BOMB, and my chili was a great success. This venison chili recipe was far better from my other chili recipe. I will continue and follow you and your recipes, you make me look like a pro in the kitchen. Haha I am happy to be your culinary wingman! Thought I made good venison chili until I tried this. Made it this eve for our family Christmas dinner and it was AMAZING! My wife wont touch anything venison and she said it was the best chili she’s ever had …period! Best chili I’ve ever had! Thanks for sharing, only chili recipi for me from now on! Best Chili I have made. Full of flavor with the Poblanos peppers adding lots of depth. This will be a staple in my recipe book moving forward! Love that it is used with venison. Thanks FVF! Even my husband loved this. He is the pickiest eater in the world! I promise. Lol. Perfect! I butcher and my ground is once through coarse plate once through fine. No additives. I also got nervous and used a half teaspoon ground cayenne pepper. We loved it. Very nice complex blend of spices and seasonings. Thank you for this recipe.